So it's late August, and I started getting emails from a school about meetings and classes and schedules and things like that. I was confused. I had to put down my knitting and take a closer look. It turns out that those paychecks I've been getting all summer? They're not actually paying me to sit at home in my pajamas and knit and go on bike rides and have elaborate lunches and go cheese tasting or sake tasting with my teacher friends. In fact they are expecting me to come and teach some children. Sigh. Well, it was probably time I stopped eating ice cream every day anyway. 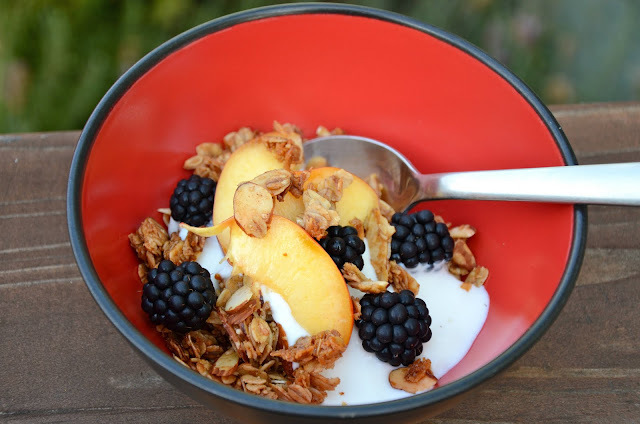 The return to school seems an appropriate time for me to share with you my granola recipe. I love, love, love my granola. It might sound like hyperbole but I am not exaggerating when I say that making a batch of it on Sunday makes me feel ready for the week, and a bowl of granola with yogurt and fruit actually makes me kind of excited to get up in the morning. For a while, I was buying my granola in bulk, but I got to talking to lots of friends who made their own granola, so I figured I should give it a try. I started out with a recipe from Joy the Baker, and after many batches and tweaks and phone calls to my friend Andrea, who is a granola guru, I've got it exactly how I like it. So friends, here it is. And once you get the idea, you can make your own adjustments to find your perfect granola - try it with different nuts (like pistachios or hazelnuts), change the sweetener (maple syrup instead of honey, or all honey), try different grains (you can use barley flakes or kamut flakes too). I eat it with a dollop of plain whole milk yogurt and whatever fruit is in season: right now, nectarines and blackberries; soon it will be apple sauce or pumpkin butter; in winter I like pomegranates and clementines; dried fruits are always good too. Michael likes it too but doesn't usually eat it for breakfast - but we both enjoy it for dessert served on top of vanilla ice cream. 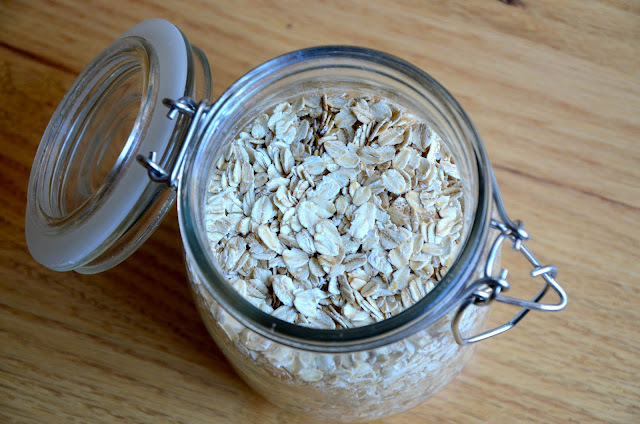 In a large bowl, stir together the oats, almonds, coconut, salt, and cinnamon. In a small saucepan, mix together the oil, butter, sugars, and honey. Cook them over medium heat until the sugar has dissolved, then add the vanilla extract. Pour the mixture over the dry ingredients and stir until everything is well coated. Pour the mixture onto the prepared baking sheet and spread it as evenly as possible. Bake for 30 minutes, stirring it around every 10 minutes. 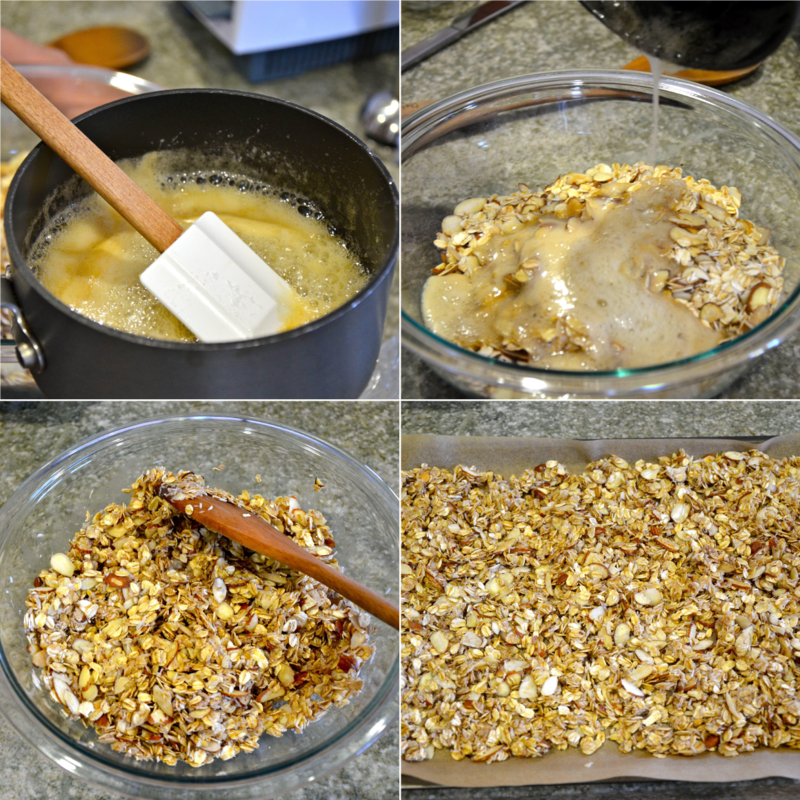 The granola is done when it has turned slightly golden brown - but note that it will not get crisp until you've taken it out of the oven and let it cool. If you're not sure whether or not it's done, remove a spoonful and set it out to cool, then taste it for texture. You can cook it longer if you like your granola crisper, or for a shorter time if you want it softer. Let the granola cool completely before putting it into an airtight container for storage - but don't let it sit out too long after it's cooled; it will lose its crunch. Looks promising! I'll give it a whirl. My go-to recipe is the one from the Cheeseboard--it's in their book. Similar to this except that while melting the butter you cook the nuts in it until brown, then add sugar/honey, then vanilla. I add all kinds of seeds too: sesame, sunflower, pumpkin. 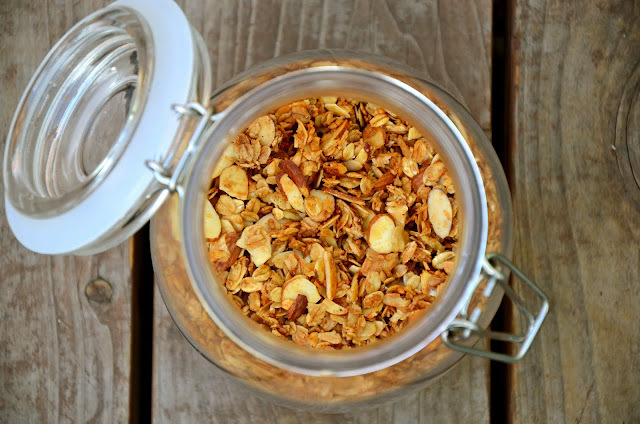 More than almost any other recipe, I think, granola is a matter of individual taste. Good idea with cooking the nuts in the butter, we'll have to try that, and experiment with different seeds as well. Maybe this is an odd question, but have you tried Quaker Oats granola with oats, honey, and raisins? If so, how does the recipe compare? I only ask because I really like that granola and I'd love to make my own, but I want to make sure I make some that I'll like. I haven't tried that particular granola but I used to buy other versions of store-bought honey nut granolas, so I imagine they can't all be that different. Give it a try, and let us know what you think!